Opening Song: Open Them, Shut Them. 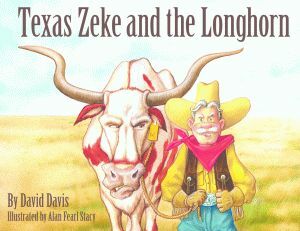 In this story, Texas Zeke buys a longhorn and wants to put it in the corral so that he can get home and have some chilli. The only problem is that the longhorn does not want to go into the corral, so Texas Zeke enlists the help of a collie, a stick, a fire, some water, a javelina, a burro, a cactus, an armadillo, a cowhand, a pretty gal, a mockingbird and a bluebonnet flower. The kids liked the repetition that’s rife throughout the story, and the parents chuckled at the ending. I introduced the kids to my magic box (which I had originally intended to decorate to make it look magical, but I didn’t have enough time, so it’s just a normal cardboard box…though one little girl did say that it looked magical to her). I told them that we were going to add some cowboy ingredients to the box and make our very own cowboy. So we discussed some of the things we would need to make a cowboy (cowboy hat, cowboy boots, etc. ), and I threw the individual pictures into the magic box. Once all of our ingredients were in, we said the magic word (Yee Haw!) and I pulled out a picture of our completed cowboy. The kids gasped and thought it really was magic. Pretty sure the parents caught onto my trick though. No cowboy can be without a horse, so our next story was about horses. 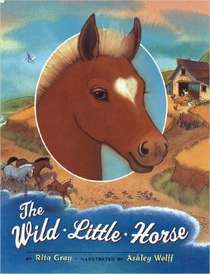 In this story, a young horse follows the wind to the sea and spends the day on his own before returning home to his parents. The story itself isn’t overly exciting (though one little girl asked if the horse was going to drown when he found the sea…that would have made this book too exciting for storytime if it had happened! ), but it has a nice rhyme and rhythm that kept the kids interested. Awhile ago, Melissa over at Mel’s Desk posted some great color and counting activities. I adapted one of these activities by using felt armadillos (and, boy, did those armadillos take forever to make!). 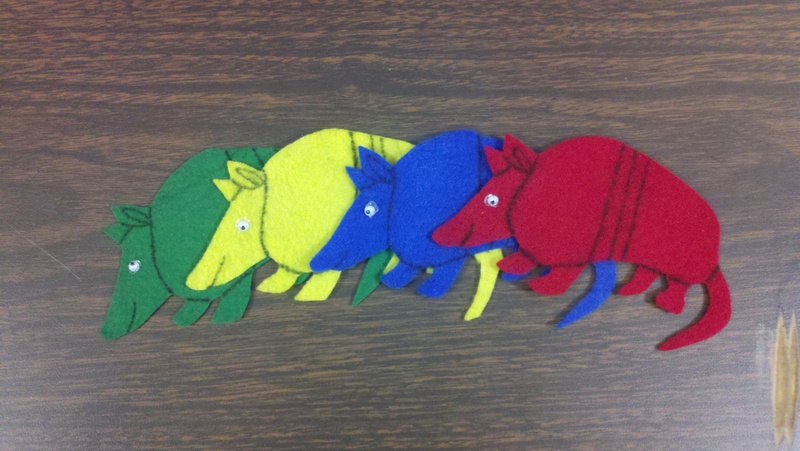 Since my storytimes are a mix of toddlers and preschoolers, I decided to group the armadillos by color and have a few armadillos in the wrong color group and have the kids help me put them all in the right group. Once all the armadillos were sorted by color, we counted how many are in each group. 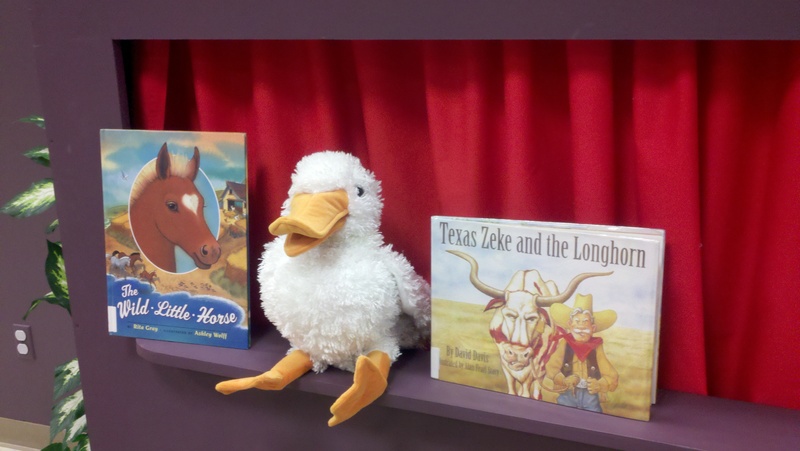 Book #3: Special Guest Reader! I introduced our celebrity author to the kids and had them give her a big round of applause. Sadly, I was so busy taking pictures of our special guest reader while she was reading that I forgot to write down the title of her new book! It was about a young armadillo who searches for the perfect home, only to find out that his old home with his parents and three brothers is the perfect home for him. And now I’m just going to give you guys a head’s up…I’m planning on participating in my first Flannel Friday tomorrow! So, yeah, we’ll see how that turns out! This is a great storytime! I’m am going to use your magic box for sure – we could make all sorts of things! That is the magic of the magic box: It can make cowboys, snowmen, birthday cakes, princesses, the list goes on and on and on! Thanks for the magic box idea. I’m always looking for ideas to keep me and my storytime friends from getting bored. Did you find out the name of her book? I am doing both a pre-k workshop for teachers and using armadillos for a week of summer reading club and have not found anything that resembled your description.